When an opposition leader announces a change, which will detrimentally affect a third of SMSFs, even in a non-election year, we need to pay attention. Bill Shorten announced that if Labor wins the next federal election cash refunds from imputation credits will be abolished from 1 July 2019. 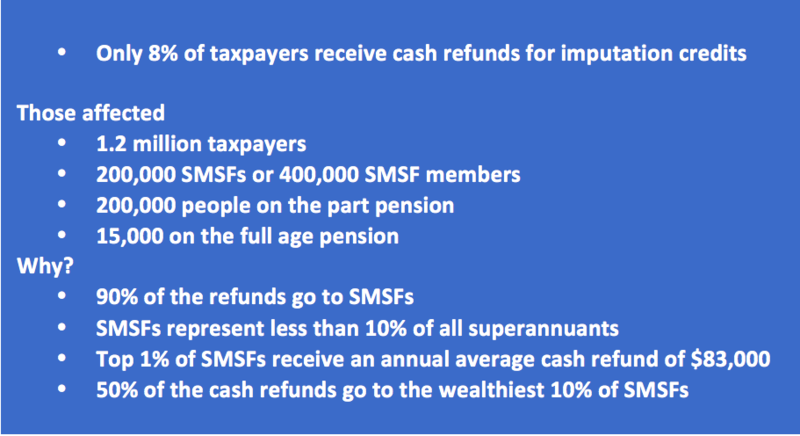 While it is being touted as a loophole enjoyed by the wealthy, this proposal hurts self-funded retirees in SMSFs the most – retail superfunds still qualify to offset their tax using imputation credits as their net tax position is positive – not due to a member by member allocation but because pooled overall, they have a positive tax position. So, the policy is a tax on the use of a particular structure, an SMSF. SMSFs in pension phase will no longer receive a refund for excess imputation credits. If you roll out of your SMSF into a retail or industry fund your franking credits are safe. If you leave it in an SMSF you are going to lose them as you are using a “tax loophole” enjoyed by the wealthy. If this becomes a reality what would it mean? 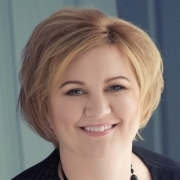 Ninety per cent of the imputation credit refunds go to SMSFs and 200,000 SMSFs would be detrimentally affected by this change, which is approximately one-third of SMSFs. SMSFs in retirement phase traditionally have a low risk profile and invest in blue chip Aussie companies that pay fully franked dividends – the refund on the imputation credits makes these investments an attractive proposition when otherwise the ROI would not necessarily fit with their investment strategy. Australian shares 70 per cent – blue chip focus – estimated 6 per cent yield fully franked. This is a significant reduction in the retirement income of self-funded retirees and another blow. They will have to use their capital faster and will qualify for a part pension sooner. Interest rates are low, the housing market is soft and removing imputation credit refunds is the perfect storm for the self-funded retiree. Post retirement you don’t want to take out an LRBA and the property market is down – Perth in particular, Sydney and Melbourne are muted. Bank interest rates are low. Heading into retirement phase you are looking for income streams not debt and not necessarily capital appreciation. Blue chip Aussie companies fulfilled that profile. It will certainly push more SMSF members across to retail or industry superannuation funds where even though their performance may be lower the franking credit will offset that. Detailed estimates have not been released by Labor, however this premise relies on Australian companies still being profitable and still paying fully franked dividends. There is no guarantee of this since we have such a high corporate tax rate. It also relies on the fact that SMSFs in pension phase won’t make changes – like moving investments into a retail or industry fund or adding additional members to the fund who are in accumulation phase to use the imputation credits to offset contributions tax. Will this change affect the ASX? Initially the change is predicted to affect the share price of Australian companies – but it won’t only be share prices that are affected – what about IPOs and capital raisings? The refund of excess imputation credits came about in 2000 – alongside the GST. When GST came in – there was in uplift in government pensions, individuals received tax cuts, as did corporates and there was a reduction in other taxes – all to compensate for the extra costs associated with GST. Self-funded retirees did not receive any of the above but they did get the refund of excess imputation credits. “Refundable imputation credits were part of the discussions behind-the-scenes back in the GST modelling and tax reform package in 2000 – in effect the only compensation self-funded retirees got for GST was refundable credits,” said Paul Drum, CPA Australia head of policy. I think we all need to put pressure on Labor regarding this policy as it’s class warfare and unfairly targets SMSF members in pension phase. An alternative would be to put a cap on the amount of excess imputation credits you can receive a refund for rather than take money from mum and dad self-funded retirees that can least afford it.